Short North - 1242½ N. High Street, Apt. 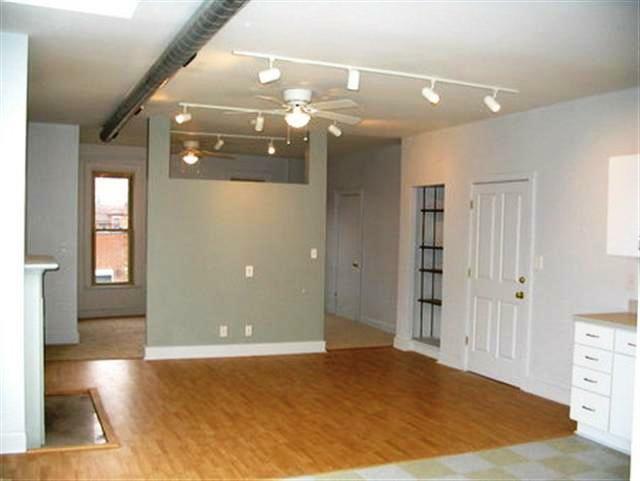 A - Available August - Located in the Short North, this newly renovated loft-style apartment is perfect for the urban dweller seeking proximity to the Short North, OSU or Victorian Village. All new appliances including dishwasher and washer/dryer. Abundance of natural light from new windows and skylights. Track lighting and ceiling fans throughout. Fireplace facade framed with original marble trim. Other amenities include: off-street parking, central air conditioning, front and rear building access, 24 hour maintenance, cable ready, built-in bookcase, pets welcome! Tenant is responsible for electric and gas. Rent: $1125/month. Square feet: 850 +/-. Pet Policy: One time non-refundable fee of $300 and a monthly pet rent of $30. For more information, please contact Day Companies at (614) 450-1760 or use the contact link below. Short North - 1242½ N. High Street, Apt. A - Available August - Located in the Short North, this newly renovated loft-style apartment is perfect for the urban dweller seeking proximity to the Short North, OSU or Victorian Village. All new appliances including dishwasher and washer/dryer. Abundance of natural light from new windows and skylights. Track lighting and ceiling fans throughout. Fireplace facade framed with original marble trim. Other amenities include: off-street parking, central air conditioning, front and rear building access, 24 hour maintenance, cable ready, built-in bookcase, pets welcome! Tenant is responsible for electric and gas. Rent: $1125/month. Square feet: 850 +/-. Pet Policy: One time non-refundable fee of $300 and a monthly pet rent of $30. For more information, please contact Day Companies at (614) 450-1760 or use the contact link below. To see our other available units, please visit Day Companies.